The new age bride is heading towards understated opulence and style. 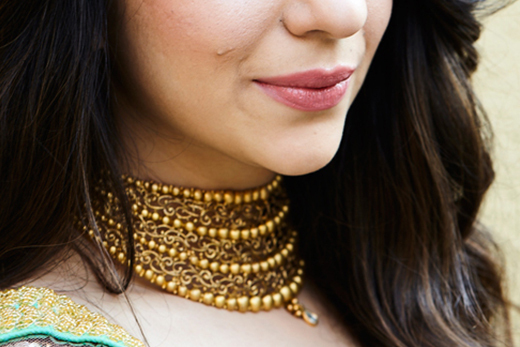 Fresh unconventional vistas of mints and pastel pinks marry the shimmer of gold sequin work for bride to be Henna�s transformation with Wedding Sutra. 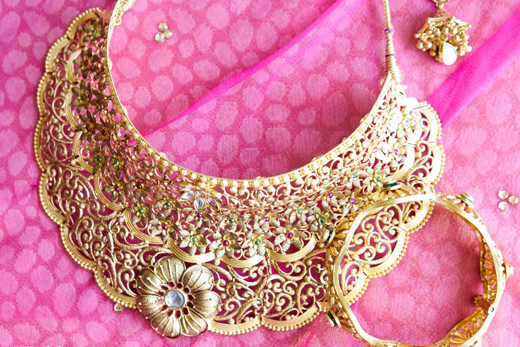 The jewellery is kept on point to the modern look with Azva handcrafted bridal choker of intricate scrolls and vines. 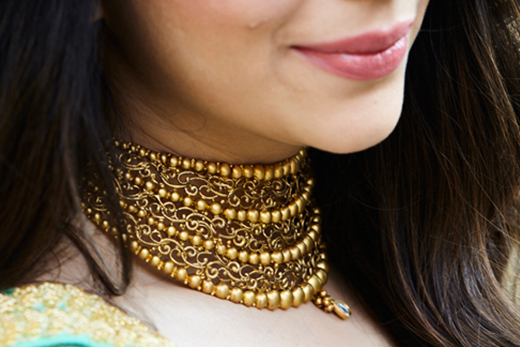 The season�s favourite foliage is created with relief in gold inturn cased between lines of beads and a drop of white kundan at the bottom. The look is all about daywear perfection with sun kissed cheeks and pale pink on the lips playing up the winged liner and luscious layers. A pair of relief work bangles in matching vine lattice and contemporary shapes jazzes up this look for her great Indian wedding.